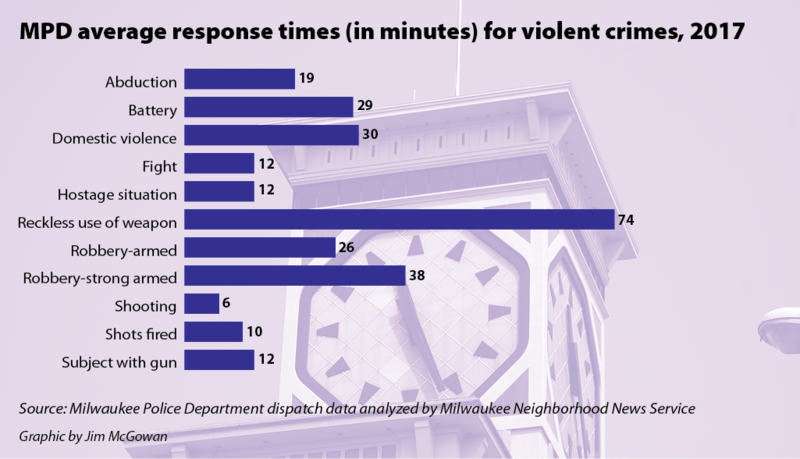 This is the first in a two-part series about Milwaukee Police Department response times. Read the second installment here. 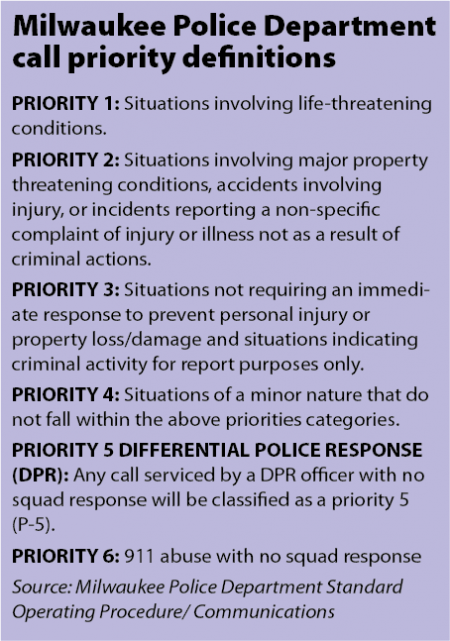 If you are the victim of an armed robbery in Milwaukee and call the police for help, you can expect to wait nearly half an hour for officers to arrive, according to Milwaukee Police Department dispatch data analyzed by Milwaukee Neighborhood News Service. “I don’t think that’s acceptable at all,” said Ald. Bob Donovan of the response times. 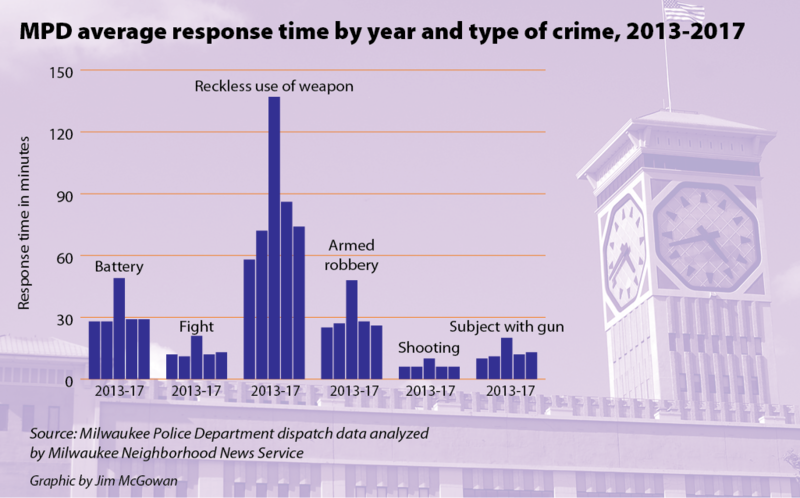 Donovan, who represents the 8th District on the South Side, said he found it especially disturbing that the response time for a violent crime such as reckless use of a weapon averaged 74 minutes in 2017. The response to calls for domestic violence averaged 30 minutes, while it took police 29 minutes to respond to a battery. Ald. Jose Perez, who represents the city’s 12th District, said it’s not just residents who have to wait a long time for police to arrive. “If there’s a shooting, that’s a Priority 1 call and will get the quickest response,” said Banks, after a recent meeting with residents in the Amani neighborhood. 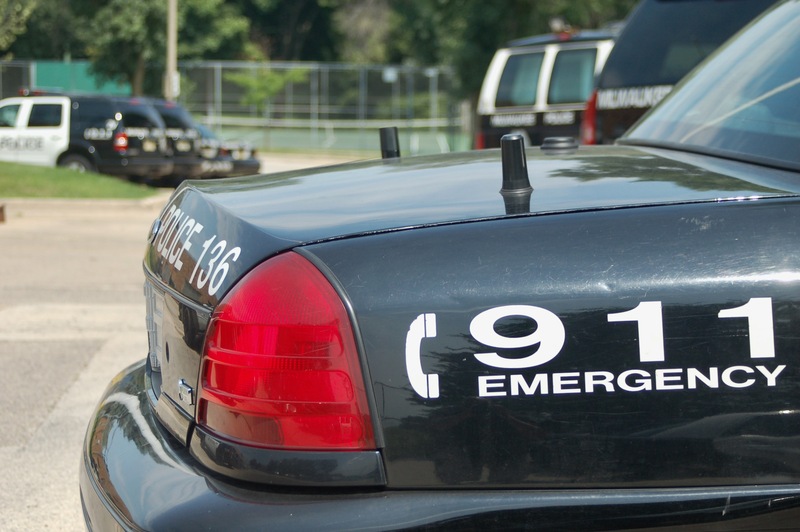 Banks said residents need to continue calling police to report crimes or emergencies, and to be prepared to provide information that could help dispatchers classify the call’s priority status correctly. “You might call and report a burglary, but if we know that someone is inside the home then that could push it from a lower priority call to a higher one,” Banks said. 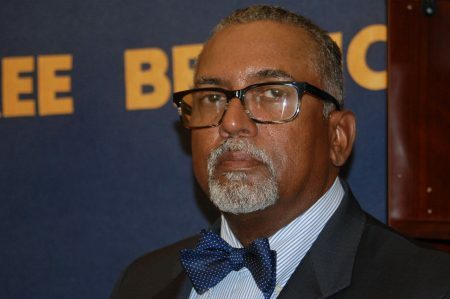 “Those jobs are tough and we want to make sure the dispatcher is someone who understands the community and can communicate what information is needed to get a quicker response,” Perez said. Lisa Schultz said she waited five hours for police to arrive at her North Side home after her son found the front door unlocked and called 911. Schultz, whose home was burglarized, said she didn’t find out right away about what happened, but police still weren’t there when she got home. “I called 911 again and told them I didn’t know if someone was still in my house. Several hours after that they finally showed up,” Schultz said. The average response time for an illegal entry was 57 minutes in 2016, when the burglary at Schultz’s home occurred. It was 33 minutes in 2017. “Flynn came out and said that if people are willing to wait hours for their cable man then they can wait for their police officer,” Crivello said. Flynn could not reached for comment. Crivello said Flynn eliminated or scaled down several specialized units in the department, such as detectives, that acted as “force multipliers” because of their ability to free up beat cops to patrol neighborhoods and respond to certain types of calls. Other “force multipliers,” that were reduced under Flynn were motorcycle and bike cops, according to Crivello. “Those guys could relieve officers regularly on car accidents because [they] were skilled at that,” added Crivello, who said he expects response times to improve under Morales. “High-risk units that used to go out and serve search warrants for violent offenders were cut down. All of the drug units were dismantled. The specialty units allowed individuals to build rapport and get to know who the players were, which helped to cut down crime,” Royal said. The shortage of police officers is another reason response times are slow, Crivello said, blaming Mayor Tom Barrett. Barrett declined to comment. “No matter how hard you try to reduce response times, if you don’t have the manpower you can’t do it,” Crivello said. “The number of officers we have currently working our streets in Milwaukee is inadequate for the levels of crime and disorder,” agreed Donovan. While police department budgets have ballooned, police staffing levels have decreased, which slowed response times, he contended. According to Royal, who once waited more than an hour for police to arrive after a break-in at his home, the issue is less about a police shortage than about policing strategies. He said a high concentration of police officers in certain areas and “stop and frisk” policies, both common strategies under Flynn, contributed to high response times. The city settled a class-action lawsuit challenging the stop and frisk policy in July. “Our city needs to be focused on better utilization of the police we have,” Royal said. “If you give somebody a job they won’t be stealing. If you reduce poverty, you reduce crime and subsequently response times,” Royal said. “I never get phone calls in my office from people looking for work. I get phone calls from people looking for people who are looking for work,” he said. While Perez agreed poverty is a major issue that must be addressed, another is the failure of the District Attorney’s office to keep repeat offenders off the streets. “We’re always surprised and upset when there is someone who is a repeat offender and they commit another heinous crime,” Perez said in an interview a week before a repeat offender who was wanted by police shot and killed MPD Officer Michael J. Michalski. “They [repeat offenders] need to be punished and taken from society for a period of time until they learn their lesson. Then our officers might not be spread as thin as they are,” Donovan said. “It’s next to impossible to make a connection between inaction at the DA’s office and higher response times. There are so many factors that influence response times. The responsibility falls on all of us to make a community safer,” Chisholm said. “People are expecting them to materialize instantly and that’s just not the case when the force is busy trying to prioritize the most sensitive situations,” explained Bautista, who said he often fields calls from residents who complain about police response times. “It impacts the community greatly when residents have lost hope in law enforcement,” Moore said. How about 7 squads for a parking violations in a Walgreens parking lot was that a good use of police personnel?